Boston's The Hush Now are poised to unleash a double-barrelled blast of swirling dream pop in the form of a third full-length and a completely remixed and remastered second iteration of its sparkling 2009 sophomore set Constellations. The new record is titled Memos and it is slated for a September release date; the quintet hopes to promote the release with an ambitious tour later in the fall. Constellations -- which the band will offer for free download via its web site from June 14 (Flag Day!) -- was remixed by Benny Grotto at Allston's Mad Oak Studios; Grotto recorded Memos and also was responsible for mixing The Hush Now's 2010 EP Shiver Me Starships. The revamped Constellations includes the heretofore unreleased outtake "The Atheist" but leaves aside original album-closer "Carousel." Also new is a surprisingly hot dance remix (yeah, you read that correctly) of the song "Thorns" created by notable Australian producer and songwriter Tony Cvetkovski. Longtime readers may recall our first encounter with The Hush Now was during the sessions for the sophomore record, specifically while founding member Noel Kelly was laying down the vocal for "The Atheist." We are pleased to learn the soaring, horn-spangled number is getting the digital single treatment, and you can stream the track via the Soundcloud embed below. Train your gaze, if you have not already done so, on the art for the single above, which was created by Allston's Doug Gately (not Don -- Ed.). A fellow named Jared Tharp crafted the updated art for the remixed Constellations, which you can also see above. The Hush Now play a record release show to celebrate the re-issue June 18 at O'Brien's Pub in Boston with locals The Susan Constant. The new version of Constellations is intended to help build hype for Memos. The sessions for the new record -- which is being mastered by Jeff Lipton at Peerless -- wrapped very recently and yielded 13 tracks recorded in a breathless eight days. Ten of the tunes will appear on Memos; the remaining tracks will be released as one-offs for various purposes which will become apparent to you. So are you ready to rock?. 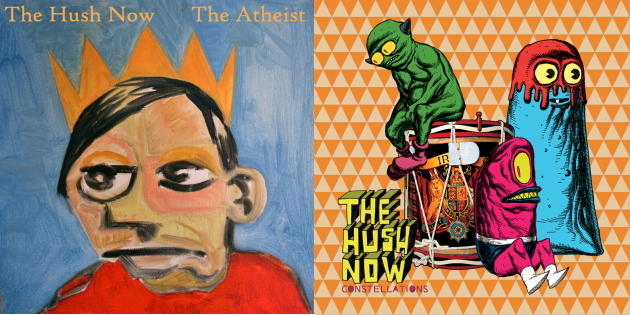 The Hush Now's "The Atheist"
YouTube Rodeo: Point Juncture, WA's "Violin Case"